Cost to grind a stump varies greatly by region (and even by zip code). Get free estimates from landscapers in your city. Cost to grind a stump varies greatly by region (and even by zip code). The average cost of grinding a stump is around $400. Stump grinding is the process of removing the visible portion of a stump from your yard while leaving the roots intact. This is a faster, less invasive, and often less expensive process than stump removal, which removes the stump altogether. Most homeowners need stumps removed when they hit or exceed 20 inches in diameter because these stumps tend to pose the most issues. The average cost of grinding a stump of this size is around $400 depending on circumstances, such as the topography of the ground and which tree species is being removed. An older or smaller tree may cost significantly less. When you have a tree cut down in your yard, a large portion of the base remains. This stump can be unsightly, detracting from the curb appeal of your property. More than that, however, stumps may be a trip hazard for people walking or playing in your yard. Because most stumps are only a few inches high, many people may not see them until they make contact. In addition, a stump can encourage the growth of new trees around it. When this happens, you may find that the cost of removing both the stump and the new trees has increased. The process of grinding the stump is often considered the easiest and less invasive way to remove one. In contrast with burning, rotting, or digging up the stump, grinding simply chews up the surface of the stump until it is level with the ground or just below it. The area around the stump is cleared of any debris before grinding occurs. Then, the grinder is positioned on the edge of the stump. A hydraulically propelled arm holds a saw at its end and cuts down and into the stump, essentially mulching 1 the entire thing. The complete process only takes a few minutes and leaves behind mulch 1 that can be either cleaned away or used for other purposes. Stump grinding is minimally invasive and simply cuts down and mulches 1 the visible portion of the stump. The roots, root system, and part of the stump that is below ground are left alone and intact. You can grind as little as 1 inch below ground level or as much as 12 inches for much larger stumps. There is less area to fill when you finish, and in many cases, the old stump can be covered over with a thin layer of loam and grass. 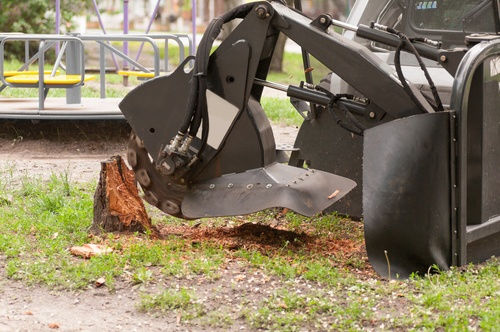 Stump removal is the process of extricating the entire stump, roots and all, from the ground. This requires heavy machinery to pull the stump up, often cutting off many of the roots during the process. This also leaves a large hole, which will need to be filled. This process is usually more expensive, costing between $370 and $675 per stump, plus a disposal fee of an additional $25 per stump. Normally, a more difficult stump, which takes more time to remove, costs considerably more. When deciding whether to grind or remove a stump, consider not only the costs but also what you intend to do with the area. If you want to plant a new tree or garden in its place, then full removal is the best method to choose. If you simply want a level yard, stump grinding may be a better option. In most cases, the cost of grinding a stump is done by the stump’s diameter or by the inch. Older and smaller stumps are usually less time-consuming to remove and may be priced differently than younger, larger stumps. In the case of more complex cases, where the topography or type of tree means that the grinding will take longer, you may find that the process is charged by the hour. Labor costs per hour are around $150. Costs are generally about $2 per diameter inch, which puts a 20-inch tree at around $400. Grinding a stump produces a great deal of mulch 1. In many cases, you may wish to reuse this, either as compost 1 or to bed a garden. However, some companies will clean up the mulch 1 for you at an additional fee of around $25 a stump. If you want to replant a tree or do other landscaping where the stump is located, you may find that the best option is to remove the stump and its roots completely. To reduce costs due to time, prepare the area beforehand by removing any debris, rocks, or small plants from around the stump so that it can be accessed quickly and easily. If you wish to DIY this job, you can rent a stump grinder for between $100 to $200 a day. You may also be able to lower costs if you can determine ahead of time if there are utilities such as gas, electric, or water near the stump. Call your various utility companies for an inspection before work begins. In the U.S., call 811 before digging on your property. The location of the stump has an impact on costs. If the stump is difficult to reach, on a hill or angle, or surrounded by other trees, it could raise the price. Stump grinding may be considered better for the environment than other forms of stump removal. By grinding, the remaining stump can decompose naturally and return vital nutrients to the ground without burning or the use of chemicals. Leaving the stump in the ground may mean that it will eventually sprout a new tree. By grinding, rather than removing, you run this potential risk. What is the average cost for tree stump grinding? The average cost of tree stump grinding is around $400 for a new, 20-inch stump. Will stump grinding kill the roots? The tree was killed when it was cut down, so the roots are already dead. However, in some rare cases, the stump may regenerate a new shoot. Stump grinding will not prevent this from happening, only stump removal. Stump grinding uses a saw to essentially mulch 1 the visible stump. Stump removal completely lifts the old stump from the ground. What does stump grinding mean? To grind a stump is to mulch 1 or grind up the visible portion of the stump, leaving the roots beneath the ground. Do trees grow back after being cut down? In most cases, no. However, it is possible for some stumps to regenerate a shoot, which can grow into a new tree. It takes roughly 1 - 2 hours to grind a 20 inch stump. How much does it cost to grind a stump in my city? Cost to grind a stump varies greatly by region (and even by zip code). To get free estimates from local contractors, please indicate yours.